She talks to birds, lives in a secluded room, and makes little outfits for mice. What a wacko. Nah, just kidding. We're talking about Cinderella, one of history's most beloved fairy tale characters, and an early star of Disney's animated feature canon, brought to life in this 1950 classic. 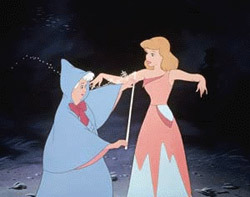 In Disney history, Cinderella is a transition of sorts: the first major release in eight years (late-'40s titles like Make Mine Music are not as timeless), it kicked off a string of major successes that line home video shelves now, decades later. Business and legacy aside, what little girl doesn't love the magic of this movie?